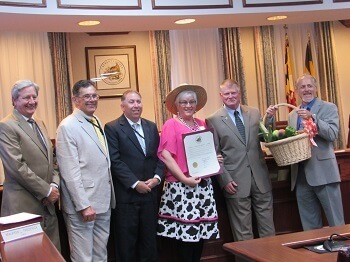 The Calvert Board of County Commissioners proclaimed the week of July 23-31st “Buy Local Challenge” in Calvert County. The Buy Local Challenge was launched in 2007 by the Southern Maryland Agriculture Development Commission (SMADC) to inform citizens of the benefits of buying local for Maryland’s economy and environment. The challenge will be celebrated in Calvert County by encouraging residents to purchase products from places offering local grown food and wine, and to dine at restaurants that include local farm food and wine on their menus. 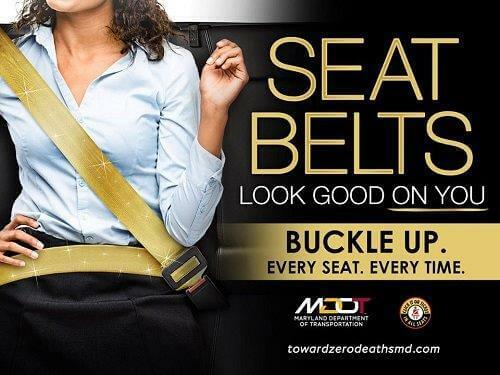 Tuesdays in Prince Frederick in the Calvert Memorial Hospital parking lot 3 pm – 7 pm, May 10 – November 22. Thursdays in Solomons on the Solomons Riverwalk, North of the Solomons Pavilion 3 pm – 6:30 pm, May 12 – November 17. Fridays in North Beach between 5th and 7th Streets and Bay Avenue 6 pm – 9 pm, May 6 – October 7. Saturdays in Prince Frederick at the Calvert County Fairgrounds on Route 231 7:30 am – noo, May 7 – November 19. There are endless ways to participate in the statewide “Buy Local Challenge.” Add one or two farm items a day to your meals – perhaps fresh eggs and bacon with breakfast one day, a snack of local fruit or a glass of local wine on another. 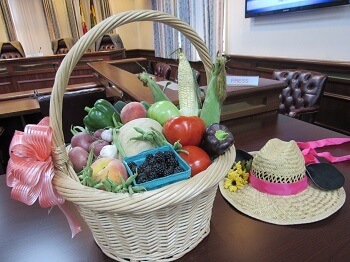 As part of the week’s celebrations, residents can shop at a temporary farmers market on the lawn of the Calvert County Circuit Courthouse on Main Street in Prince Frederick every Wednesday in July from 12 to 4 p.m. 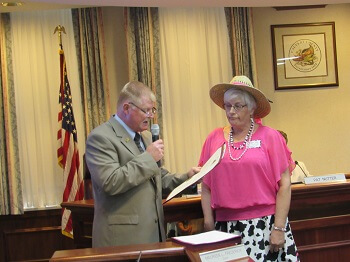 The Chairperson of the Calvert County Agriculture Commission, Susan Cox, affectionately known as “Mrs Moo” from Spider Hill Farm was there to accept the proclamation. 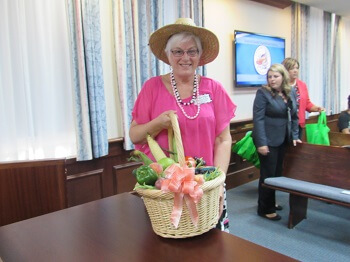 She brought with her a basket of fresh produce. The proclamation read in part “Calvert County agriculture provides high quality, locally grown and produced food for all citizens of this great state and around the world. Local farms link the past to the present and are important to the county’s economy,, environment, and quality of life of future generations. Support for Calvert County farms is found through its citizens’ desire for farmland and their choices to purchase fresh, locally grown produce, which contributes to higher nutrition, better taste, less waste, and less pollution”.